From Team Rubicon - "POS REP"
White Lake, MI: The mother of an EOD Soldier, he with multiple tours in Afghanistan, wants to bury the EOD Working Dog that he adopted in a military cemetery. However, there is a problem - it's against the law! After U.S. Army Sergeant Corey McCourt graduated from Livonia Franklin High School, he became an explosives expert assigned to an army mine detection team -- a real life hurt locker. He's done tours in Afghanistan and is still serving in the war on terror. He worked alongside a military legend, Mina, a male black lab who did nine tours of duty in Afghanistan, three tours with Sergeant McCourt. "The dog sits in front of the bomb and my son, who does this, he goes in and he disarms the bomb after the dog finds it," says June Etlinger. Mina was also promoted to sergeant and then later retired with an honorable discharge from the army. But at the age of 13, Mina developed a serious lung ailment and sadly had to be put down. So with her son serving, mom volunteered to arrange for Mina's final resting place. She choose the Great Lakes National Cemetery in Holly. The cemetery serves as the resting place for our nation's military. ...all national cemeteries are guided by federal law and there are no provisions for the burial of animals. They cited the federal law from 1973 -- the National Cemetery Act. The law reads burial of animals is not permitted. That includes canines who served the U.S. in combat. 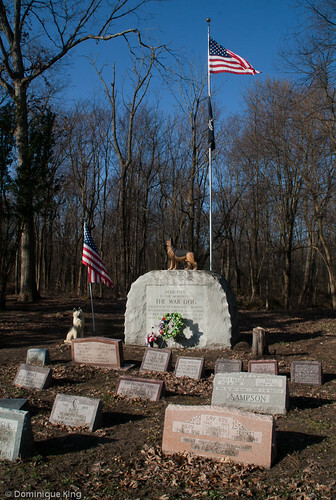 There has been a decison made yet by the family but another option exists: There is a Military War Dog Cemetery in Lyon, Michigan. I'd like to think that, with the continued and more recognized service of Military Working Dogs, someone in Congress can quickly put together legislation in a bi-partisan manner to right this wrong. I will pass this onto my Congressman and see if he can spur this.